Custom Bronze and Brass trough sinks from Handcrafted Metal can be made as long and as deep as you need. Every feature can be customized, including the number, shape, and size of the bowls. Choose from additional features, such as backsplashes and drain boards, to further personalize your sink. Each Bronze and Brass sink is fully welded and polished, and made with the purest Bronze available. Also, each sink has coved corners inside for easy cleaning, and can be made with drop-in mount, under mount, or flush mount rims. Click on any Bronze sink below to see more pictures, and customize it according to your specifications! 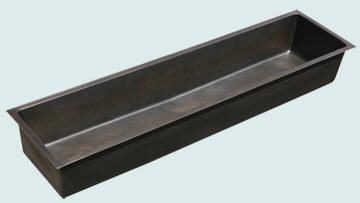 This extra large bronze trough sink is big enough to accommodate 2 faucets with room to spare. Our darkened bronze makes a strong contrasting element with a lighter counter top. Smooth, all-welded, seamless construction and rounded inside corners make cleaning a breeze. 16 gauge bronze. Sure-Drain (tm) engineered slope construction ensures reliable water movement to the drain.